The top five companies listed on this comparison site are all affiliated to the site itself. A price comparison website is supposed to give you honest and impartial information to help you locate the best deal, right? No so with with gold buying comparison sites. A recent BBC programme discovered the site they investigated was rigged and listed prices from companies they were affiliated with. Our own detective work has revealed other so-called ‘comparison sites’ can’t be trusted. The BBC investigation, broadcast on Radio Four’s ‘You and Yours’ programme, followed a number of complaints about the service and deals offered by scrap gold companies on the gold buying comparison website, www.compare-the-gold-price.com. The company highlighted in the investigation and one of ten then appearing on the compare-the-gold-price.com website was www.cash-for-gold.co.uk. On their own site, cash-for-gold.co.uk promise “more per gram than any other gold buyer”. However, all the programme’s participants received offers from cash-for-gold.co.uk that were significantly lower than they expected, and often lower than the cash-for-gold.co.uk’s online gold calculator said they’d receive. In one case, broadcast on the Radio Four programme, cash-for-gold.co.uk only offered £845 for gold items that were actually worth £2,200. All the participants had found cash-for-gold.co.uk listed as one of the ‘top ten’ gold buying companies on compare-the-gold-price.com. They’d chosen cash-for-gold.co.uk as, at the time, it offered the highest price on the site. However, as the BBC’s investigative journalist discovered, the top listed gold buying companies listed on the compare-the-gold-price.com were all run by, or connected to the same individuals. This meant the comparisons were artificially rigged, and a scam. Additionally, the prices per gram shown on the comparison website hadn’t changed for several months, despite the actual price of gold fluctuating on a daily basis. Incidentally, the British Gold Refinery – (britishgoldrefinery.co.uk) – has recently been rapped by the Advertising Standards Authority for running misleading pricing information on their website, has been slammed by the BBC TV’s Ripoff Britain programme for dishonest trading and is also is the subject of a Facebook campaign by disgruntled former customers, calling for the company to be closed down. To give the site a veneer of credibility, compare-the-gold-price.com also listed a price from H. Samuel – a well-known High Street jeweller, and a name the BBC’s callers recognised and trusted. They said that because H. Samuel was on the site, they felt the comparisons would be valid. In fact, H. Samuel was horrified when the BBC contacted them; the company hadn’t given its permission to be on the site, and in fact hadn’t provided an online gold buying service for over a year. The price couldn’t possibly be genuine and was obviously a fabrication intended to make the other gold buyers look more attractive. H. Samuel’s spokesman said the company would refer the matter to their legal department. Interestingly, H. Samuel no longer appears on compare-the-gold-price.com’s website, which now quotes a price from Tesco Gold Exchange. Again, this is presumably without permission, as the price per gram shown on the comparison site is not what Tesco Gold Exchange is actually offering (at the time of writing this article). It wasn’t only the prices received from cash-for-gold.co.uk that gave the Radio Four You and Yours callers cause for concern. In each case, they’d had to threaten legal action either to get a price, or to get their gold returned. 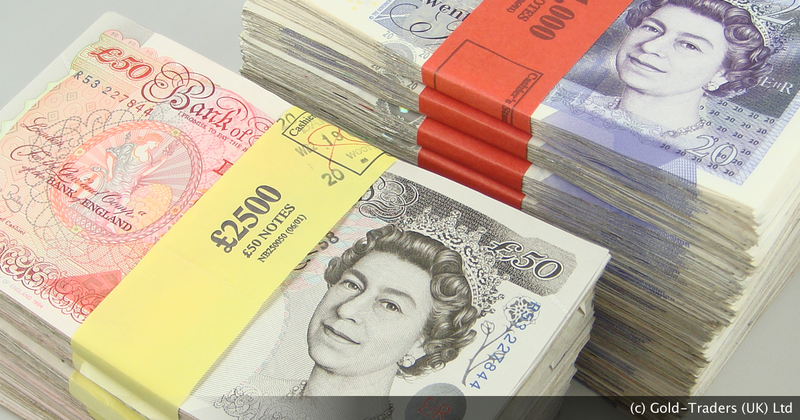 One caller admitted she accepted what she knew was a very poor price from cash-for-gold.co.uk, because she feared she’d never get her gold back at all. And remember, the other top three companies on this so-called comparison website were connected with cash-for-gold.co.uk – so you could expect a similarly poor response from them. Our own researches have shown this problem isn’t isolated to compare-the-gold-price.com. If you dig deeper, you’ll find most of the gold buying comparison sites are either affiliated to, or receive income from those sites it lists. 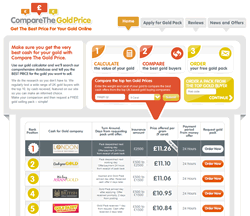 For example, the comparison site comparethegoldprice.co.uk lists goldrefiners.co.uk as their top paying company. Not surprising when you discover those two sites are connected! Gold buying comparison websites purport to offer a fair and transparent comparison of the prices different companies will pay, as we’re used to seeing with insurance comparison websites. However, insurance comparison sites are regulated by the Financial Conduct Authority, but there’s no control at all over the gold buying comparison sites. Another point to note is that the gold buying companies appearing on similar comparison sites generally pay commission for referrals. That’s typically £20 – £30 per referral, which goes to the comparison site owner and is inevitably deducted from the amount they’re prepared to pay you for your gold. We don’t pay affiliate referral fees (as they would result in lower payments to our customers). In short, you’ll be rewarded with a better price and a higher standard of service than you could ever expect from a comparison site. im glad I had a look around before I sent my gold off to the “Londongoldrefinery ” as advertised on that web comparison site, “comparethegoldprice” as they them selves ” London gold refinery ” seem to be scammers as well, and they are NOT in London as led to believe but in Manchester. also the ASA have had complaints from customers of “comparethegoldprice” for false advertising and they are also Linked to 3/4 gold compare companies on there own site!. both complaints have been upheld against them etc on 08/01/14 but still seem to be using the same format/wording etc on there web site. Just to add to this discussion – it’s still going on – and if anything it’s worse. Someone just paid between 30p and £5 for my click and now I’m on a price comparison website. So my visit is worth something to the site. I must be making them money. Someone they’re reviewing will be paying them more than my click cost. Simple arbitrage. If you know about affiliate marketing you guess the top voted company will be an affiliate link. Sure enough – looking at the link structure it’s a paying link for the PostGoldForCash.com going through Affiliate Window. Fair enough. Valid marketing method – and the review site will earn between £10-£30 for a lead. Except, Affiliate Window pulled that program months ago. This means the review site is paying good money to bring people to the site with NO MEANS OF COMPENSATION. Clicking on semrush.com, it quickly becomes clear that this review site is paying thousands of pounds a month for this traffc. Previously it earned money from Affiliate Window, and now it doesn’t. OK, looking at PostGoldForCash.com’s website we see a big happy positive social-proof that they are “Rated Best Online Deal by the #1 Gold Buying Comparison Site” complete with a GoldPriceChecker logo. So PostGoldForCash.com (owned by 2 Kings Ltd) does nicely out of this deal. Back at GoldPriceChecker.com, I wonder who has won their coveted title of the “best place to BUY gold”? A company called TheBullionCentre.com gives “the best online deal”. Who owns TheBullionCentre.com? Well fancy that, it’s 2 Kings Ltd.
OK, looking again at PostGoldForCash.com’s website, there’s ANOTHER consumer site heaping praise on this company. This time it’s CompareAndRecycle.co.uk. Doing another search for the best places to sell gold, CompareAndRecycle appear. And again, sure enough this paid click leads to a page where PostGoldForCash is the clear winner. Just a shame the affiliate link isn’t paid anymore – it must be another public spirited company. By now I’m smelling a big fat old fradulent advertising scam. I truly hope this doesn’t extend to print advertising, in say a major UK retailer, say like WH Smiths. Oh but wait it does – there’s a big mention of GoldPriceChecker.com on the point of sale materials in WH Smith. No mention of any conflicts of interest. So there just can’t be can there? Now I’m absolutely not explicitly saying PostGoldForCash, TheBullionCentre and GoldPriceChecker are up to no good. That would be bad without proof. But they’re all registered with Webfusion. And who knows what more digging would reveal? « How much is 14ct gold worth per gram? How much is 9ct gold worth per gram? How much is rose gold worth per gram? How much is 18ct gold worth per gram? How much is 14ct gold worth per gram? Unsure of the weight or type of gold you have? No problem! Simply complete our simple online claim form and send us your scrap gold for a free, no-obligation quote. Gold-Traders rated 4.9 / 5 based on 629 Gold-Traders reviews.